Location. 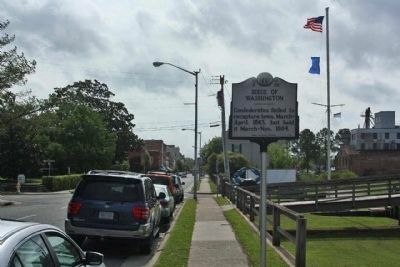 35° 32.655′ N, 77° 3.598′ W. Marker is in Washington, North Carolina, in Beaufort County. 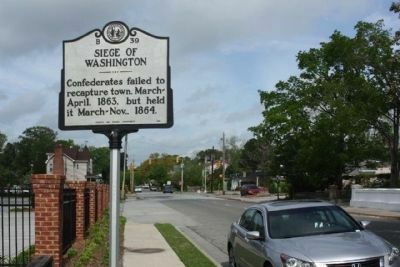 Marker is on West Main Street near Van Norden Street, on the right when traveling east. Touch for map. Located 1 block east of Highway US 17 Business. Marker is in this post office area: Washington NC 27889, United States of America. Touch for directions. Other nearby markers. At least 8 other markers are within walking distance of this marker. Havens Memorial Building (a few steps from this marker); Attack On Washington (within shouting distance of this marker); C. C. Cambreleng (about 400 feet away, measured in a direct line); John H. Small (about 400 feet away); African Americans Defend Washington (about 500 feet away); USS Picket (about 600 feet away); Burning Of Washington (about 600 feet away); Lindsay C. Warren (approx. 0.2 miles away). Touch for a list and map of all markers in Washington. 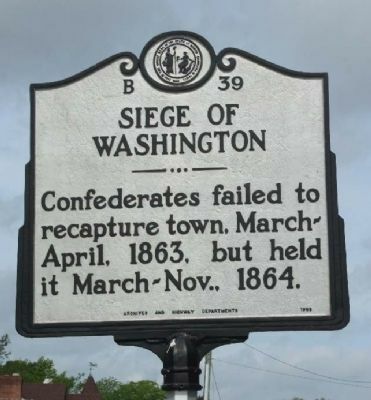 under federal control until April 26, 1864 (the present marker states incorrectly that the Confederates held Washington from March until November) when, as a result of the Confederate victory at Plymouth, Brigadier General Edward Harland was ordered to withdraw from the town. For four days the evacuating troops pillaged Washington, destroying what they could not carry. As the final detachments were preparing to leave Washington on April 30, a fire started in the riverfront warehouse district, spreading quickly, until about one half of the city was in ashes. More. Search the internet for Siege Of Washington. Credits. This page was last revised on June 16, 2016. This page originally submitted on April 24, 2013, by Mike Stroud of Bluffton, South Carolina. This page has been viewed 419 times since then and 11 times this year. Photos: 1, 2, 3. submitted on April 25, 2013, by Mike Stroud of Bluffton, South Carolina.